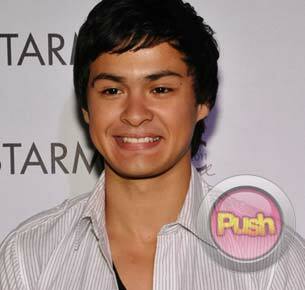 Matteo Guidicelli talks about what attracts him to a girl. After the success of Agua Bendita, rising actor Matteo Guidicelli is gearing up for his next role as the leading man of Kim Chiu in the upcoming Kapamilya telerseye Binondo. In the latest issue of Chalk Magazine, the Fil-Italian hunk admits that he never thought he'rsquo;d get so many big showbiz opportunities so soon after choosing to come back to the country to continue his studies. The 20-year-old had originally left his showbiz and racing career to pursue a degree in Performing Arts, majoring in Musical theater at Columbia College in the United States. The young actor said he had never imagined he would be considered for a lead role so soon. "I just couldn'rsquo;t believe it. Here I was, barely back in the business. I kept wondering why, out of all the new actors out there, they chose me. I'rsquo;ve never been a leading man or anything!" he recalled. Playing a visually impaired person on Agua Bendita was an unforgettable experience and having the show become a success was a big bonus for the actor. "The ratings were so high they kept extending it. And to think that Andi'rsquo;s (Eigenmann) new, I'rsquo;m new'mdash;it was crazy. It was the best thing that happened to me," he admitted. For 2011, the Cebu-raised heartthrob wants to prepare himself well before they start taping for Binondo and the other projects lined up for him. "I want to do more workshops to improve myself; I wish to work on a movie or another show; and I hope to work on my album," he said. Not dating anyone at the moment, Matteo said a love life is not high on his priority list. "I'rsquo;m single and not dating. Sana, pero wala pa. I want to give my 100 percent to my career right now," he said. In the December 2010/January 2011 issue of Chalk, Matteo also shared that he is especially attracted to petite half-Pinays who are simple and good-hearted. "I really like a simple girl. She doesn'rsquo;t have to be over-the-top. I want somebody who'rsquo;ll take care of me. Someone who'rsquo;ll always be there for me, and someone who'rsquo;ll understand my quirks," he said. Although he was recently linked to Maja Salvador, whom he escorted to the Star Magic ball, Matteo denied any special relationship with Maja them and stressed that his career is his main focus at the moment. Matteo also said he'rsquo;s also learned something important when it comes to dealing with girls. "You never know what a girl'rsquo;s thinking. They'rsquo;re just weird. And you can'rsquo;t do anything about it. You just have to understand them and smile! Haha! " he said in jest. Read the full story on Matteo Guidicelli in the current issue of Chalk Magazine where he tops Chalk'rsquo;s list for it'rsquo;s 50 Hottest Guys for 2010. Chalk is published monthly by ABS-CBN Publishing and is available at all leading bookstores and newsstands nationwide.